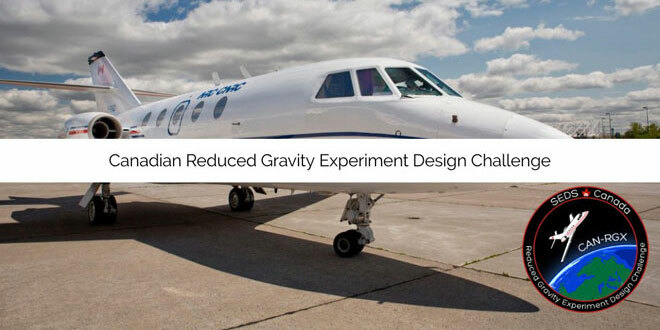 Canadian Reduced Gravity Experiment Design Challenge. Credit: SEDS Canada. “We are offering students a unique opportunity to get involved in the development of a scientific experiment and test it in a weightless environment, similar to that experienced by astronauts in orbit.” says Elias Solórzano, Chair of SEDS-Canada and graduate student at the University of Toronto. Team COSM’s project involves determining the effectiveness of different dust collection systems in reduced gravity, whose data they hope will be central to designing equipment for future space research that effectively deals with harmful dust contamination. Project STARFOX’s proposal aims to better understand the dynamics of mineral screening in a microgravity environment, through altering existing terrestrial techniques of mineral screening and separation. Team AVAIL’s proposal aims to study the effect of a reduced gravity environment on the behaviour of coiling liquids, which will improve our understanding of additive manufacturing in space. Their hypothesis is that the liquids will sustain a longer column before buckling. Team iSSELab intends on studying the effect of reduced gravity on 3D printing materials by observing alterations in the crystallization process in the reduced gravity environment. The competition is being done in collaboration with the National Research Council and the Canadian Space Agency and includes sponsors MDA and Canada’s Aviation and Space Museum. “The National Research Council of Canada is proud to be part of this extraordinary opportunity working with the student teams to realize their project plans in microgravity flight. NRC’s primary research aircraft, the Falcon 20, will help our next generation of researchers realize their future potential in the space sector” says Derek Gowanlock, Research Flight Test Engineer at the National Research Council of Canada. Each team will have two students who fly onboard theFalcon-20 aircraft as Mission Specialists to operate their experiments with each flight consisting of at least 12 parabolic maneuvers. The timeline for the remaining four teams is as follows with the winner being announced later in the summer.